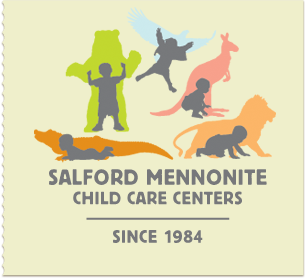 Salford Mennonite Child Care Centers » Our Educational Philosophy » Imagine. Play. Learn. Since 1984. The classroom teaching team designs a developmentally appropriate curriculum around the interests of the children. Math, science, and language can be included in any topic that has captured the curiosity and attention of the children. The physical space of the room is considered to be a primary element of the curriculum. It becomes the third teacher, following first the child and then the classroom teacher. Children learn through age-appropriate, quality play, which in integral part of curriculum and early childhood education. When children make choices in classroom centers, they develop self-confidence. When they negotiate roles, they improve their social skills. When they experiment with materials, they explore their creativity. When they listen to stories, they advance their language skills. When they explore the wonders of nature, they learn the rules of science. When they climb, swing, and run, they enhance their physical skills. When they pause to pray, they discover they are spiritual beings.